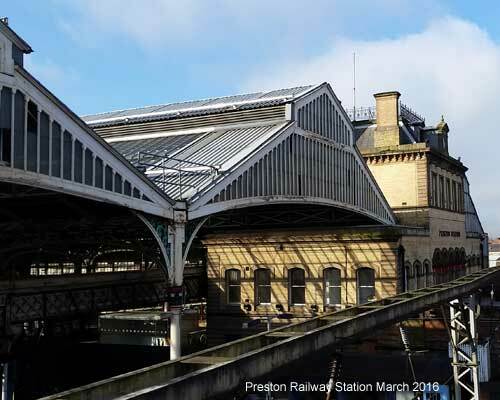 This page includes Preston Station and the History of Railways around Preston. Plus Trams of which plenty were made in Preston. 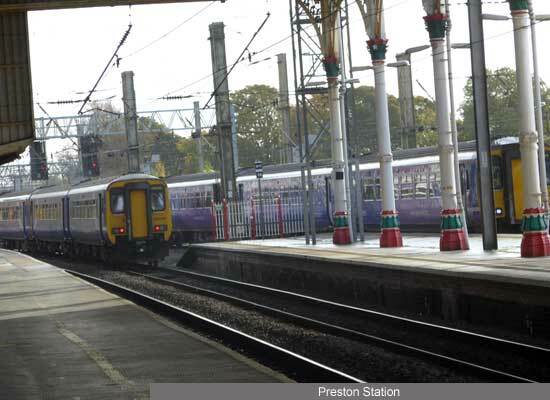 Preston station is about 100yds back from the main shopping street, Fishergate, which crosses over the track. 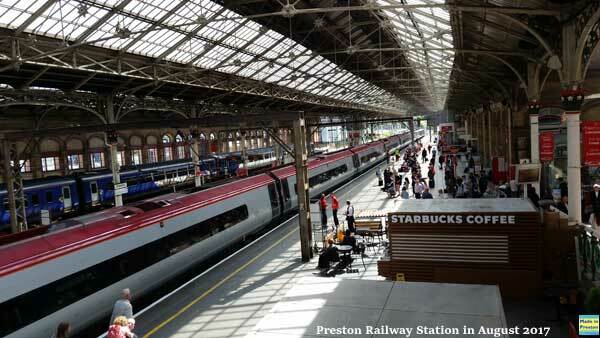 Located on the West Coast Main Line about halfway between London and Glasgow and on the routes to Manchester, Liverpool, Blackpool and Blackburn, Leeds. 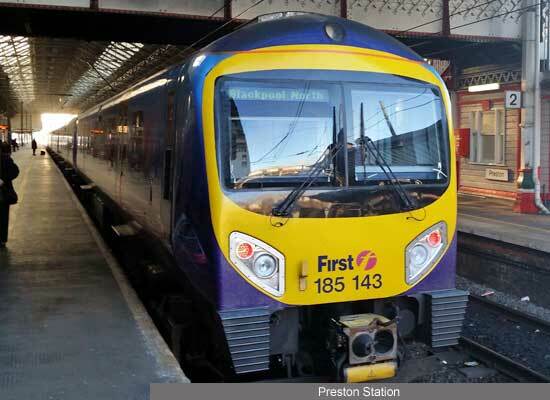 Platforms 1 and 2 are mainly trains between Manchester and Blackpool or York via Blackburn and Blackpool. Platforms 3,4,5,6 are mainly trains on the West Coast Main Line between London, Birmingham, or Exeter and Glasgow or Edinburgh, Windermere or Barrow. Between platforms 3 and 4 are the main services; cafe, papers etc. Platform 1/2 has refreshments at certain times. 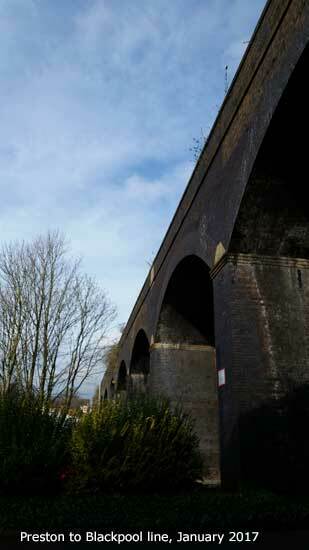 It's a fairly old station completely covered by traditional arches, but facilities are modernised. The ticket office is on the central entrance that leads to platforms 3/4. An alternative entrance is over the bridge that crosses platforms 4/5 etc and leads to the Fishergate Centre. There is a bridge to all platforms near the entrance or a subway at the opposite end. Taxis are mainly at the central entrance and buses on Fishergate railway bridge. The bus station is a 20 minute walk. There is a large new railway multi-storey car park on the Fishergate Centre side. 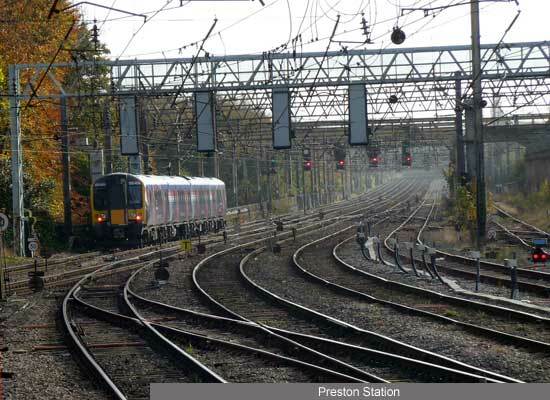 Work to electrify the line between Preston, Blackpool, Manchester via Bolton started in 2017. 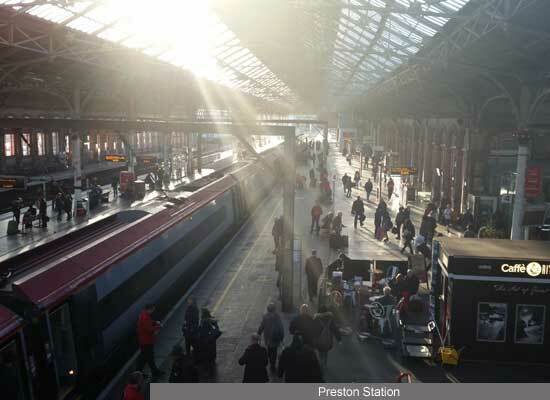 The electrified line between Preston and Blackpool North opened after 6 months closure in April 2018 which enabled trains between Blackpool and Liverpool, Manchester via Wigan, and London to be electric. During closure and at regular weekends there have been replacement buses mainly supplied by Blackpool Transport. 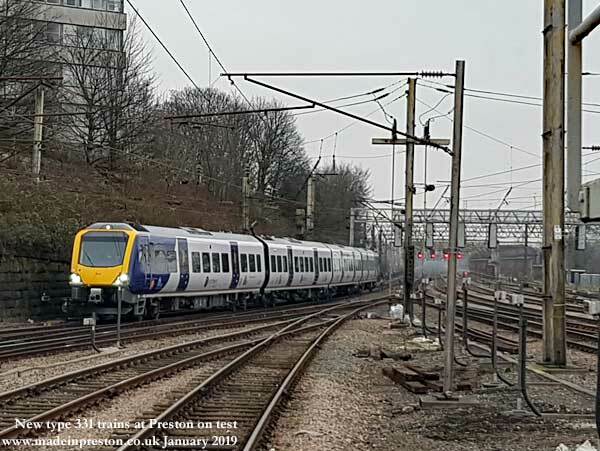 The line from Preston to Bolton and Manchester was meant to be electrified at the same time but in January 2019 it has still not been completed and no promises are around. 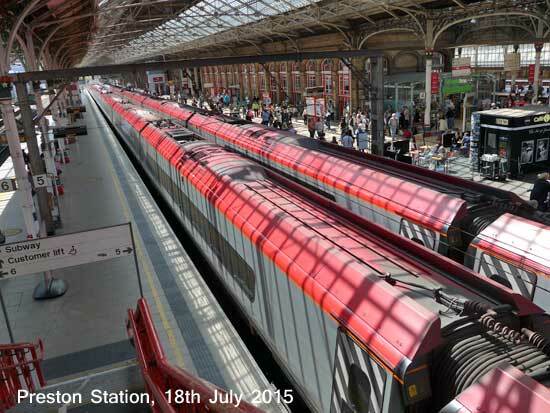 This meant that diesel trains were unexpectedly needed to operate Blackpool to Manchester via Bolton. Throughout 2018 work has continued on the Preston to Bolton line which needed tunnels rebuilt and suffered subsidence, as well as soft ground meaning the electrical pylons needed re-building. An ongoing industrial dispute about guards on trains as well as the delays to track and train deliveries coupled with an ambitious timetable update that needed redrafting due to delays has meant a poor service on that route in 2018. 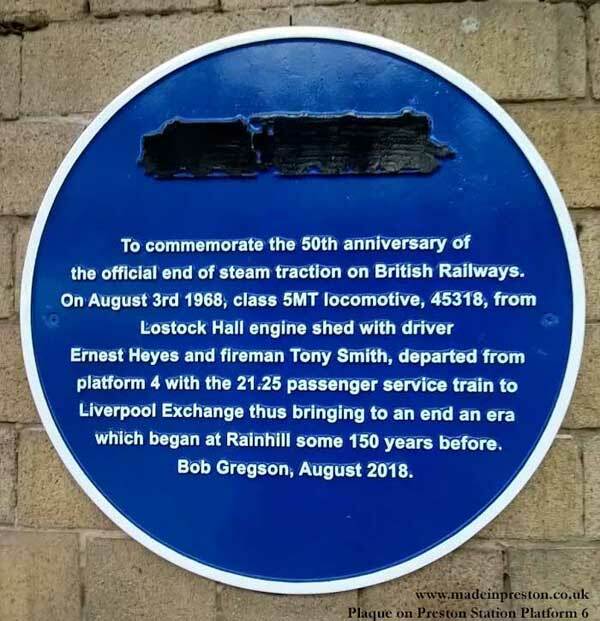 Bob Gregson author of interesting books on Preston and Lostock Hall railways arranged for a plaque to be placed on Preston Station to mark the last steam train 3rd August 1968. History and map of the railways around Preston. A horsedrawn railway was built in 1803 to take goods and return coal from the Lancaster Canal terminal in Preston to the Preston to Wigan.....click here to read more. 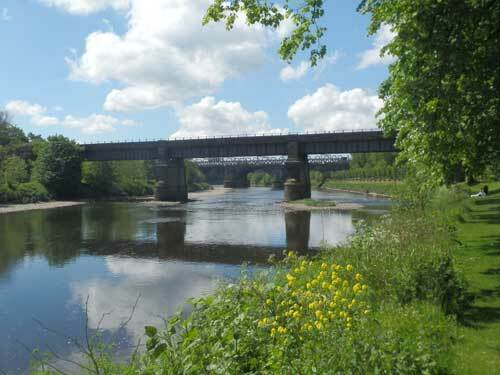 Photo of the L&YR Bridge now disused and the Grand Union Bridge carrying the West Coast Main Line over the River Ribble entering Preston at Avenham Park. Made in Preston - Deltic Prototype Locomotive - English Electric. Photograph above of Deltic Prototype entering Preston. Classic photo location showing St Walburge's spire in the background - photo adapted from one in the book titled Locomotives by Brian Reed published in 1958. Locomotives built in the area. Ribble Steam Railway is running specials on its 1? mile dock and riverside line at Preston Dock. There is also a newly built museum and workshop. The line crosses the Preston Marina entrance via a swing bridge, and runs alongside the diverted River Ribble on the site of the former sprawling docklands. This track once took goods from the dock to Preston Station, crossing Strand Road. Following a visit in August 2012 we now have a full page of photos and information. Click here to view it. 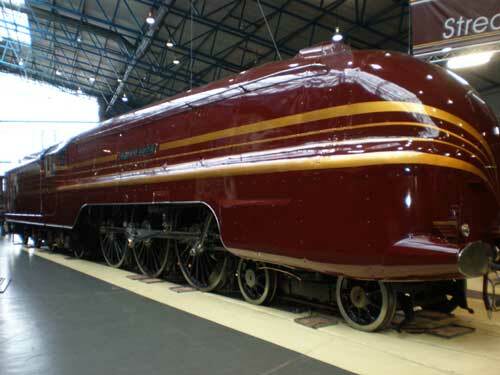 46229, LMS Pacific 'Coronation Class' Duchess of Hamilton in Streamline at York - November 2009. The work was done in Birmingham at Tyesley Works. I bet they're proud of that job. Deltic at York 2002. 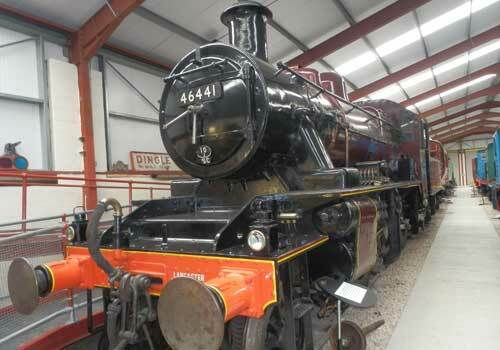 It's now at Locomotion, Shildon. 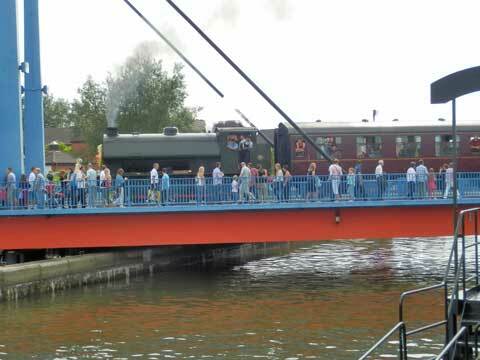 See the Ribble Steam Railway page as it is now on loan there during the Preston Guild 2012 and for 2013, at least (thumbs up, fingers crossed). 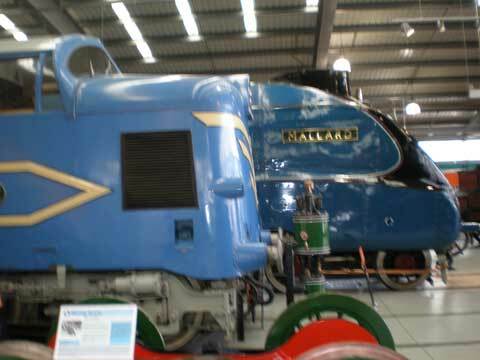 Deltic at Locomotion at Shildon in 2011 with Mallard. Photo below. 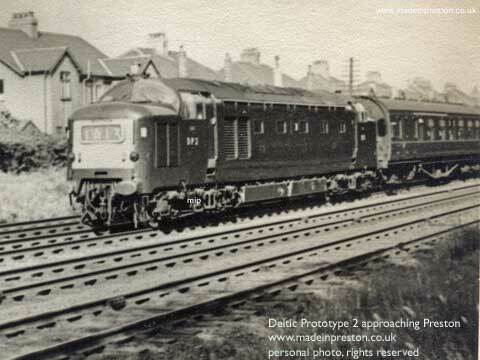 DP2 Deltic Prototype 2 (some say Diesel Prototype 2), made at Newton-le-Willows in the production batch, entering Preston pulling the Blackpool to London express. 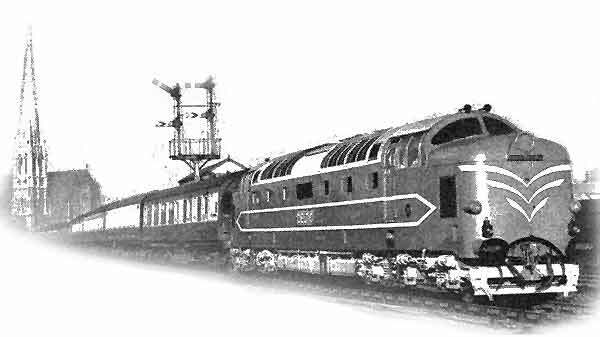 DP2 was an engine test bed, it had a later version of engine as used on the Class 50 diesels which were more numerous than the Deltics. It was used on the West Coast Main Line until moving to the East Coast Main Line where it was destroyed in an accident in 1967. Note the 4 tracks at Ashton, a northwest suburb of Preston. These divided at Kirkham into the 3 routes to Blackpool which were: 1) from Kirkham to Blackpool South and the now demolished Blackpool Central via Lytham St Annes, 2) from Kirkham direct to Blackpool Central which is now partly the M55 and Yeadon Way, 3) north via Poulton Le Fylde to Blackpool North. There are currently 2 tracks and they are being electrified in 2012. The route via Lytham St Annes is single track going as far as Blackpool South. The route via Poulton Le Fylde takes the main traffic which goes into Blackpool North. 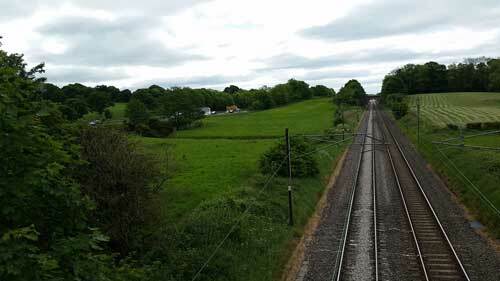 An enthusiasts group is hoping to re-open the line from Poulton Le Fylde to Fleetwood. The rail traffic to Blackpool on a summer weekend was phenomenal up to the mid 1960s with 'specials' from all over Britain queueing along the line. You could count them all in and then count them all back, on a good Saturday over 200 trains through Preston in the first half of the day. Foreign holidays, the car and then the M55 reduced rail traffic to Blackpool significantly. The photo below was given to me in exchange for another over 40 years ago. There was a good trade, by us train-spotters, in train photos.